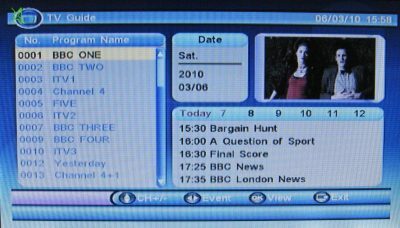 We fell across the Nikkai A00JQ LCD TV at our local Maplin store – A 7 inch analogue and digital TV with support for multimedia – for £70. Here’s our review of this small telly. What is the Nikkai LCD TV? The model number for this little telly, should you need it, is the Nikkai JV-TVC707EA. This compact little 7″ TV is made under the Nikkai brand for UK firm Maplin has proved to be the perfect little find. Ideal for sitting on a desk in a home office to provide TV while working on the PC. The Nikkai LCD TV has both an analogue and a digital tuner, so it’s capable of getting the Freeview TV and radio channels if your aerial can get a decent Freeview signal. For those in areas that have not made the digital switch, it’s also capable of getting the standard analogue signals of BBC1, BBC2, ITV, Channel 4 and 5, as well as from a Sky box RF out socket. It’s also capable of playing back media from a USB stick – handy for watching AVI files, watching a slideshow of photos or listening to music. The Nikkai TV comes with a telescopic aerial, which for us was not able to get a great signal, and we stood no chance getting Freeview where we live. The telly is also supplied with a more sturdy desktop base aerial (intended for cars, we assume), which got an acceptable analogue signal. The telescoping aerial can be removed, leaving a standard co-ax aerial socket for connection to a rooftop aerial. We plugged into an aerial socket, and hey presto – all of the analogue and all of the Freeview channels. Auto-setup made scanning for channels a breeze. 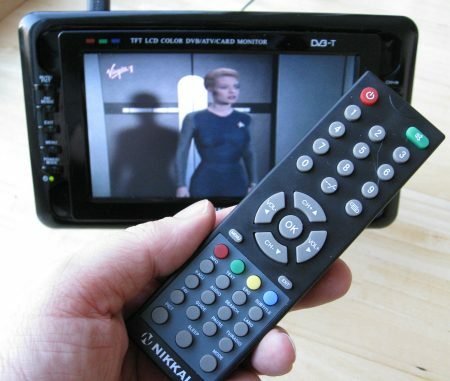 We’ve also been using the Nikkai as a digital picture frame with images on a connected USB memory stick, and for playing back our small collection of TV shows in DivX AVI format. The Nikkai is pretty easy to use. Most of the functions are available from the buttons on either side of the screen, but everything can be driven from the remote. Negatives? No – not really. The TV is not the most stylish unit in the world, but that’s aesthetics. The only real down size is the audio – the speakers are fairly small, and on the rear of the TV, which means the sound is adequate, but not stunning. 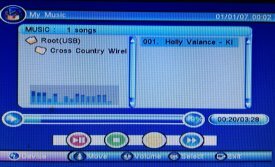 Compared with a larger TV, or even a TV on a PC with a decent set of speakers, the audio is a little tinny, and MP3 music playback was a little disappointing. Good news is that there’s an audio out, so you can hook it up to a better set of speakers, or run the sound through headphones. Otherwise, hard to fault – good clear picture, easy-to-use. Got a question about this little TV from Nikkai and Maplin? Ask away. We’ve received a few requests for help in finding a manual for the Nikkai 7″ TV. This was available as a PDF file from the Maplin Site – It was shown on the entry for the Nikkai 7″ flatscreen TV at Maplin – Last time we checked, the product was no longer listed, meaning the manual was not longer listed either. If you can’t find the manual, try contacting Maplin Support. It’s an easy fix. Press the “Mode” button to get to Analogue TV mode (a blue screen with “TV” in the left corner). Now, press ‘Menu’, scroll down to ‘System’ and scroll right. Scroll down to the forth icon (a square with two arrows), and change the value. For us, option “3” shows picture the correct way round. As far as we can tell, there is no way to change the settings other than through the on-screen menu. There is no reset button. The only thing I can suggest is that you try to navigate to the menu using the instructions in the book – Even though you can’t see the screen, you should still be able to follow the steps in the manual to change the menu options and change the picture position. We have the 7″ version here – If we can help with the menu settings, let us know. Otherwise, give the Maplin helpdesk a call. To re-tune (scan for Freeview channels), press ‘Menu’, scroll right to “SETUP” and select “Installation”. Then press the “OK” button to scan AUTO SCAN. Normally, we’d suggest getting a programmable Universal controller as a replacement, but as the Nikkai is not a common model of TV, we’re not sure a universal controller would have the codes needed. Probably best to contact Maplin’s Customer Support team to see if they can help with a replacement. Their number is 0844 557 6000, and their website is here: www.maplin.co.uk. Sadly, it’s not a fault. The ‘Red Button’ / Digital Text services are not available on this little telly. 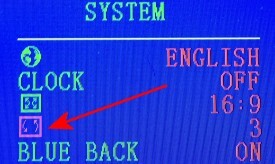 We assume it doesn’t have the appropriate MHEG software built-in to support this functionality. To disable subtitles, go to the “Setup: Installation” menu, and set “Subtitle Language” to “Off”. You can also toggle subtitles using the grey Subtitle button on the remote control, which pops us a Subtitle dialog letting you turn subtitles on or off. Do NOT buy this! Utter junk. It is not pertable except the fact you can move it. You need to be connected to the mains. It does not work with aeriel supplioed. You need to connect it to your house aerial. The controls are hoopeless. I t does not play most files. And my machine broke after 10 minutes. contimual use. The picture comes and goes but sound remains. Utterly useless. 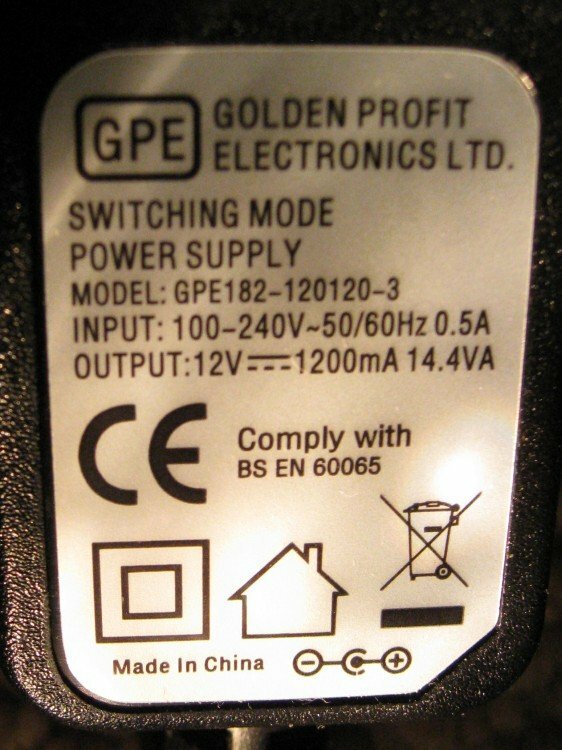 I have recently got this out of the attic, when I switch it on, I get a screen for 1 second then goes off, there is power, just no screen, can you help? 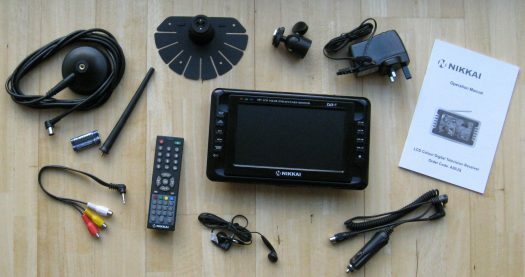 Just bought a second hand 10.2″ portable DVB-T/ Analogue TV and Digital Photo Frame but it does not have a remote control or a manual. Have tried to view photos on screen but although it recognises there is an SD card in the slot and the camera it has come from, it says there are no photos, when in fact there are on the card. A02JQ 10.2″ screen. I have recently accidentally banged – and sadly damaged the screen resulting in no picture. But everything is in good condition and includes both the remote control and A02JQ manual – still in protective bag! Are you still interested? 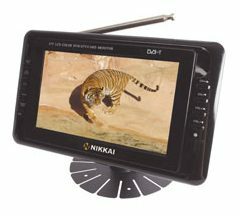 Have just purchased a second hand 10.2″ portable Nikkai DVB-T/Analogue TV and Digital Photoframe. No remote control or manual with it. Cannot get my photos from the SD card onto the screen. It says on the screen there are no photos on the card but there are at least 20. Tried both the SD card and a card reader via the USB. Also,cannot find the Card mode on the menu. Any help would be appreciated. I have replied below – as I have what you needed! Bests, John. Hi I bought this a while back and have a need to use it whilst away, on switching on everything ok, but I can’t get the menu to come on, I’ve pressed the button several times but it won’t let me access the menu settings at all ! Cheap and nasty maplins crap,I have used 3 times over 16 months and it’s packed up.maplins have discontinued it and they say they don’t have any contact details for nikkia (what bull maplins come out with) so it’s a bin job and maplins won’t get a penny ever out of me again. now it comes on with a screen you can’t hardly see in black and white. anything I asked they repeated sorry sir it’s out of gaurentee. he replied sorry sir it’s out of gaurentee. All EU purchases are covered with a 2 year warranty. Aside from that all products must be fit for purpose for a reasonable amount of time, for electronics goods sold in the UK thats typically 6 years. Do not let the ignorance of customer services tell you about their 12 month warranty and a pile of other excuses, it is not what their company policy is that matters, its is EU law. I’ve had mine for over a year with excellent usage in my den, it works with the telescopic antenna fine and I’m about 30miles away from the transmitter which when you think of the complexity of a digital television signal is pretty good, it does drop out ever now and then, but WAY better than the grainy picture with analogue TV ! I have a very small home made tv antenna in the loft made out of coat hangers, and coax and has 8 elements strung up there ! That brings in everything at very good strength with no drop outs or pixelisation ! I have Nikkai HD DV3-T and fortunately it works OK. But as I have no manual, can anyone tell me how to edit the list to group favourite channels together? Unfortunately, due to accidental damage the screen no longer works on my 10.2″Nikkai A02JQ Digital tv purchased from Maplins. I still have everything, still in original Nikkai box in good condition – including manual and remote control. Is anybody still interested in parts please?